Is the White Rabbit of Wonderland the same as the Easter Bunny? That would explain why the eggs are all made of chocolate – clearly the work of Wonderlandian hens. In celebration of Easter, I naturally decided to incorporate Bunny Blanc in some festive photos. 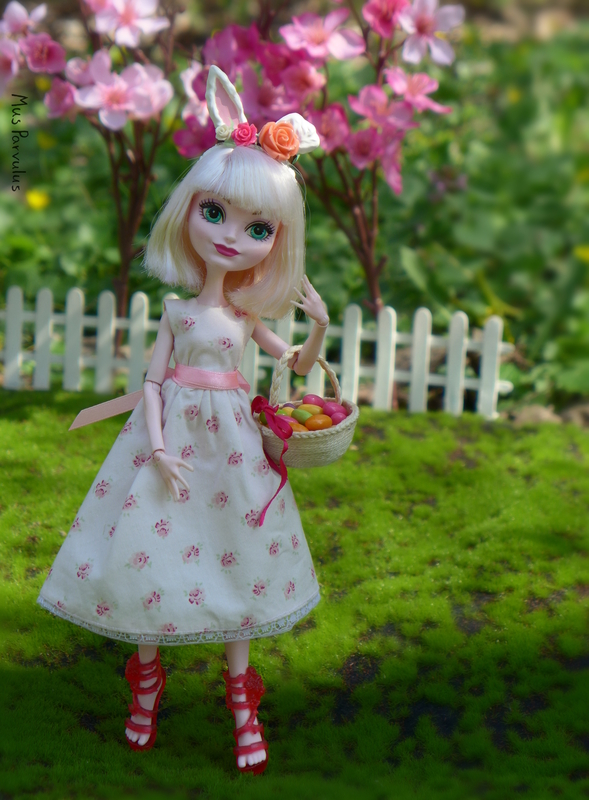 I dressed her all pretty and spring-like, in a dress I had sewn a while back. Bunny’s signature top-hat seemed a little too uptight for the occasion, so I used her Archery Club headband instead , which I also repainted. Before the repaint – what do you have against a little paint, Mattel? After the repaint – I think the band was supposed to be a laurel wreath (hard to tell), but it suits me more to pretend it’s fur. I think I lost some detail in the layers of paint, but I still like it more this way. I didn’t want the watch showing on this occasion either, so I temporarily covered it with polymer clay flowers. As for the ‘eggs’… Off-brand Tic-Tacs in a variety of colours 🙂 Obviously, they don’t need to be off-brand, but these just happened to come in an assortment of colours straight from the packet. What you wouldn’t know from the pictures is that I had to do the “photo shoot” twice. On my first attempt, the sun went away just a few minutes after I left home The whole morning until then it was perfectly sunny! I tried to take the photos anyway, but all the colours turned out weird. It was frustrating to have to re-take the photos, but the first experience did help me do better the second time around. One of the more acceptable photos from the first set. My husband said they were OK and to let it go, but the yellow tones really bugged me, and the rest of the photos were even worse. All’s well that ends well. With a little extra effort, I managed to come up with something I am content to share in celebration of Easter. My intention from the start was to swap the heads on these two. I had never swapped heads before, so I was certainly a little nervous! I tried finding some advice online. I did find a few photos and videos, but all in all, I feel like nothing out there can thoroughly guide you through the process. You need to feel it for yourself to judge how much force you need to apply, and wiggle things around until the head comes off. 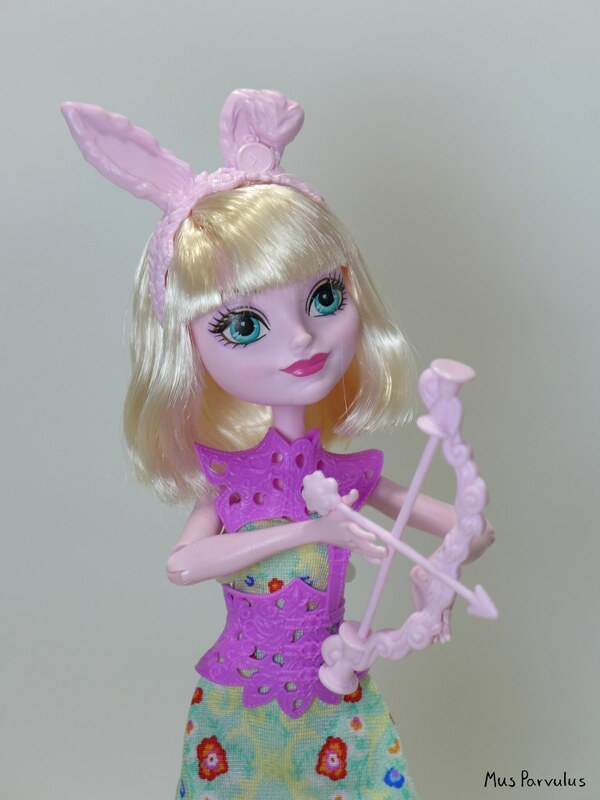 This is what the neck peg looks for Ever after High. See the plastic getting white from the strain? These are the most endangered parts. Also, it is these thin prongs that you will need to somehow wiggle out through the narrow neck hole, probably one at a time. I make it sound scary, huh? It was a little scary for me, but many people do this regularly with no casualties 🙂 Pulling the head off is the difficult part. Slipping the new head on isn’t much of an issue. Overall, everything went well for me – hurray! Her body has a peachy undertone, and her face has a cool bluish undertone. The difference is easily noticeable when you look for it, but I feel like it isn’t particularly distracting otherwise. She kind of looks like some of us look like with make-up on, maybe? The difference is also less clear when she has her arms down, the white fluff of her vest obscures her neck. Another thing worth taking into account is that her new head is slightly smaller, and her headband sits more loosely. If you move the doll it may slide off, but it stays on fine on display on the shelf. Finally, the Archery head doesn’t have her ears pierced. I have seen a tutorial suggesting that it is possible to pierce them yourself, and I’m considering it. Frankly, though, her earring were never all that visible to begin with, so I’m not in a huge rush. Overall, the re-headed Bunny is not perfect because of the slight colour discrepancy. It also bugs me that I reward the manufacturer’s mistakes with both releases by buying not one, but two dolls! But all in all, I feel like the resulting doll looks very much like the doll we deserved in the first place – both sweet like her character and properly articulated. A slight mismatch or not, I do enjoy her in this form way more than any of her official releases. 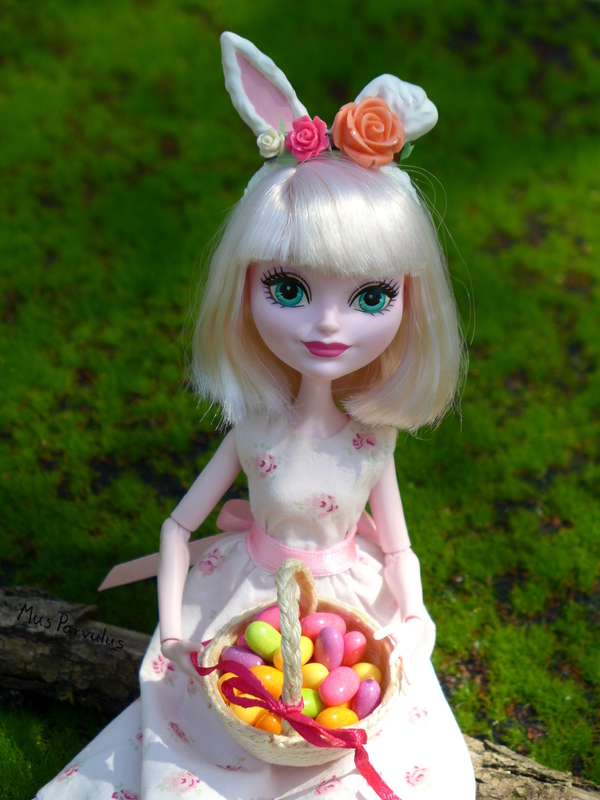 Signature Bunny Blanc was my first Ever After High doll. She captivated me with her unique design, colour scheme and personality. 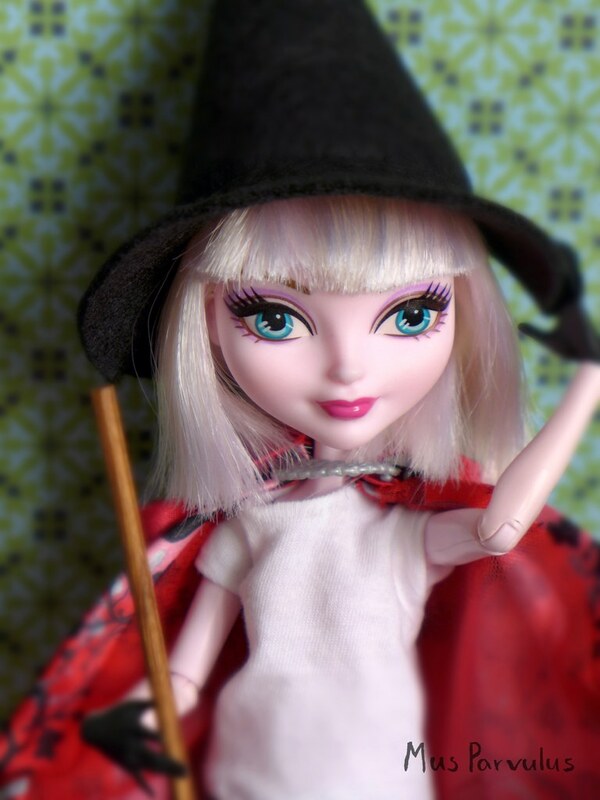 A lot of time seems to have passed since then, and a lot seems to have changed in Ever After High. Let’s see what the latest release of this character has to offer! I have seen some beautiful box art with EAH, but this is neither really good or really bad. Note that there is no stand included in the set. This one was generously lent by another Royal. Her strongest aspect is probably her face, arguably the best one on Bunny so far. There is a very slight smudge of dark paint near her left eye. The hair is gelled stiff. 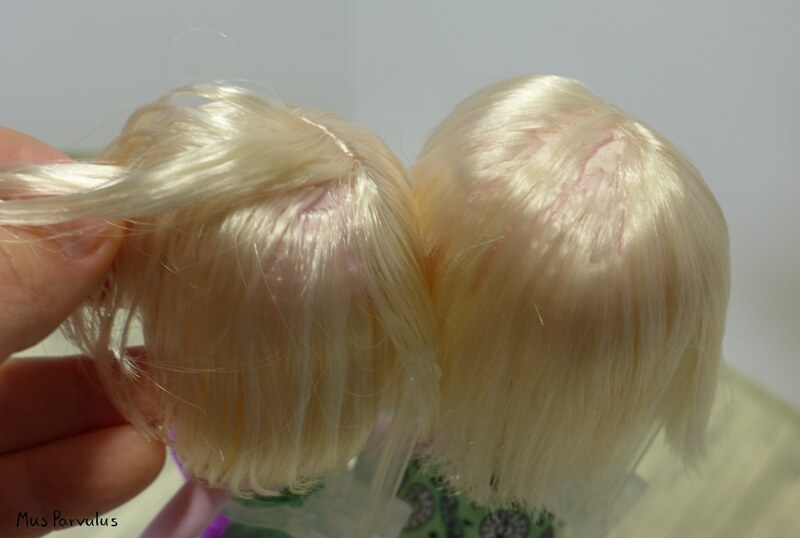 I’m not particularly bothered by that – unlike the ‘glue-headed’ dolls from a few years ago, the hair can be easily restored to full glory with a simple wash – and I certainly will do just that. Her headband has a fairly nice sculpt, unfortunately, it is lacking any painted details whatsoever 😦 The details resemble a wreath of leaves and a pocket watch. Her dress is the plainest piece of fabric I’ve ever seen on an Ever after High doll. 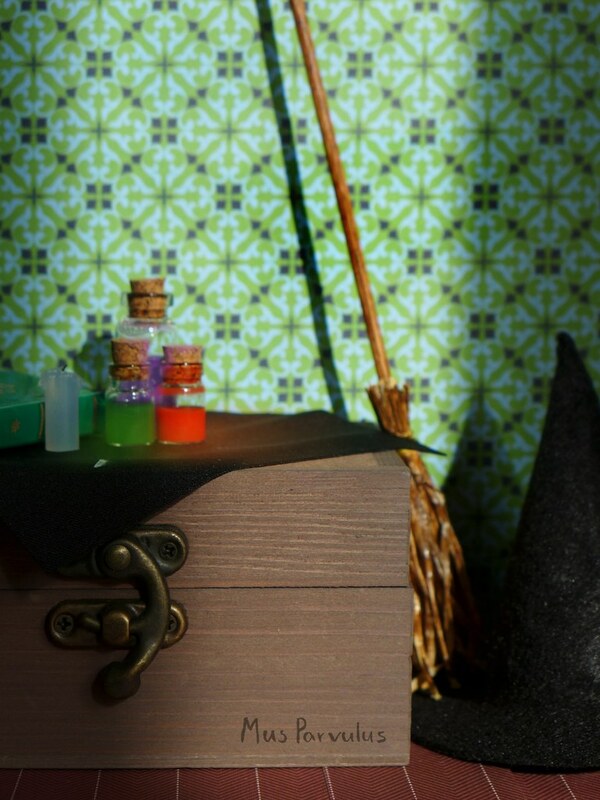 It is very loosely in-keeping with Bunny’s theme, but only through the general minty colour. The floral design looks un-inspired and the cut is nearly the simplest it can be. As an amateur sewist I can confirm that sleeveless dresses are one of the simplest options to make, so, whenever I can, I like to buy toys with more elaborate clothes. Even I can make something that looks like this. Worse still, the pattern only goes halfway to the back! 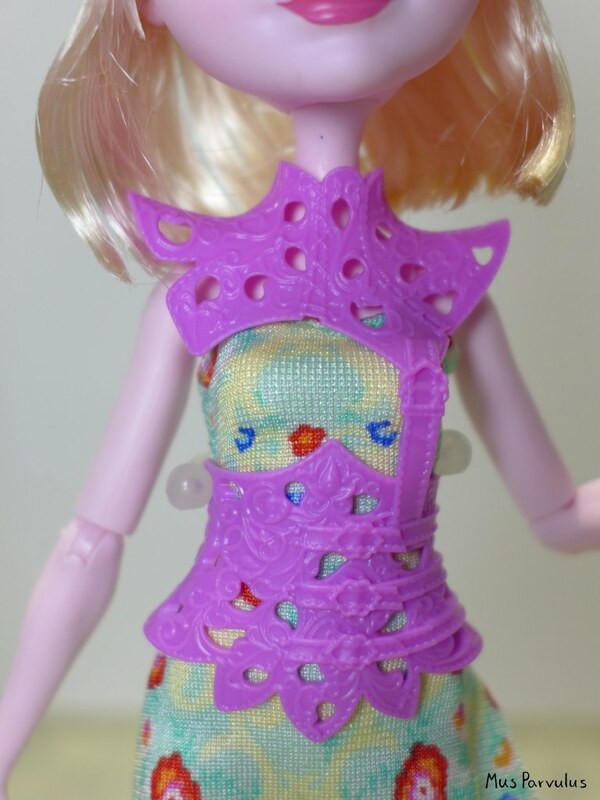 I cannot be persuaded to believe that Mattel is too poor to make a dress with pattern all over it. The dolls are not at all cheap enough to make up for this, too. This does upset me. Not even knock offs do this, to the best of my knowledge. If there is a positive, it would be this chest-piece. It could certainly use some paint, and the choice of colour is questionable, but the sculpt itself is very intricate. I do see a decent design with a lot of potential for customization. As it is out of the box, it isn’t enough to help the overall impression by a lot, though. 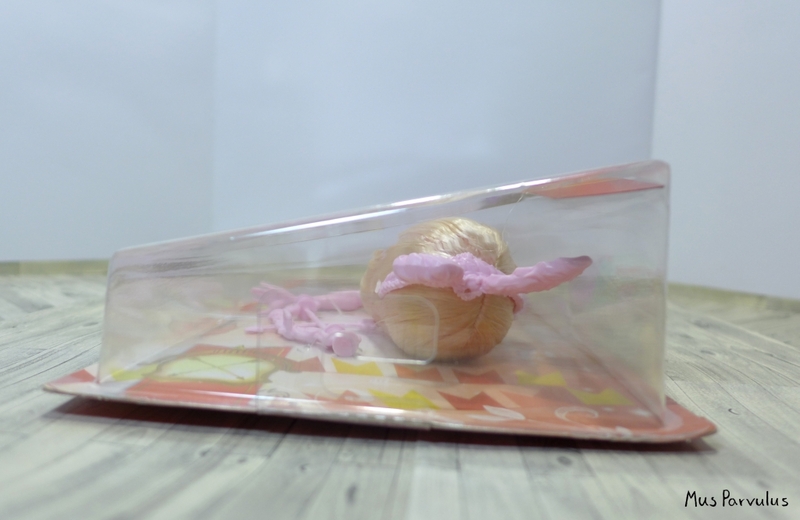 We now come to perhaps the most hated aspect of recent EAH releases – the infamous moulded on leggings. I must say I agree. Not only are they the same garish, un-Bunny colour, they also have protruding sculpted details. This means it would be extra hard to cover them up with fabric tights or leggings. I think I could potentially get over moulded tights if they were smooth and a more gentle colour, but the real stuff is of course the best option. I think they are fine in themselves, but they do not really fit the character or the theme. I mean, yes, there are many floral accents in the outfit, but I’m not yet convinced they make sense. 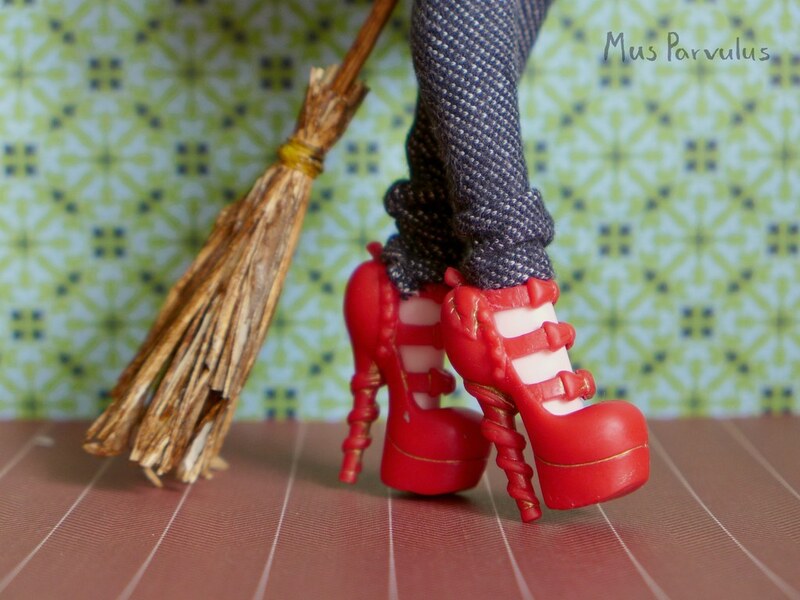 The shoes may still see some use from me in a more fantasy-themed stylisation. Even in that case, I still have one point of criticism for them: while they are overall floral and delicate, the heavy wedge detracts from the dainty feel. The shoes feel soft rubbery, perhaps slightly more so than the signature Bunny’s. They certainly tried to give it some style with intricate carvings. The hourglasses and the cute bunny tail do indicate that this is Bunny’s own property. This time around, I wish it was a little simpler and more versatile, but this is totally just my inclination to re-use and share accessories between dolls speaking. Are you curious what her pink-purple legs look like, all clothes removed? I sure was. It looks odd, given my knowledge of how tights and underwear work, but I suppose it’s best not to dwell on this. As far as articulation goes, this doll has a reduced number of joints. The legs don’t bend, and they have a smaller range of motion to the sides. They do move all the way forward and slightly to the back. The arms and elbows move all the normal ways you might expect them to. The wrists are an exception, with no joints they obviously don’t move at all. The joints in the arms were a little stiff, but overall functional. The head is as usual,with movement to the sides as well as up and down. I really like her in this style! With a little shaking, patting and waiting, she was soon all dry & ready. Despite the wash, the hair maintained the general shape and style, and that’s probably a positive. Let’s see how the new Bunny compares to the original. I had always known that signature Bunny has a problem with her eye print, but until I had another to compare, the problem was somehow less striking. Now there is no escaping the fact that she is wall-eyed. The two dolls do have quite a different appearance for being the same character. The eye-colour is the same and even the make-up is almost identical – even though it didn’t have to be. It’s like they want to stress the continuity in the face of the new developments. The eye shape and the face-shape are very different, with a different expression, in a way that almost suggest a different personality or attitude. Personally, I think the changes are for the best. 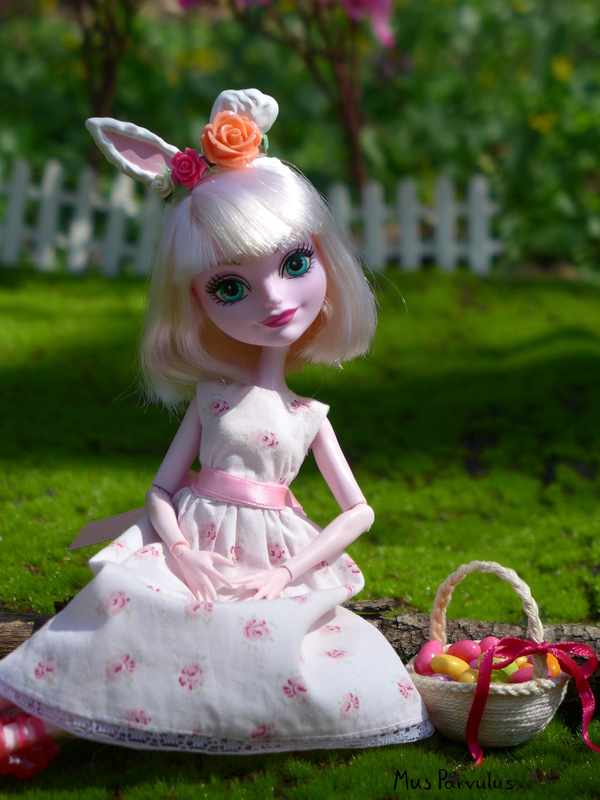 The new Bunny may be unlike her previous doll selves, but she seems more true to her character from the series. Notice also that there is a slight difference in the skin tone. The Archery doll has more blue undertones. Her hair is also more shiny. It is also a tad more soft and overall very nice to touch. 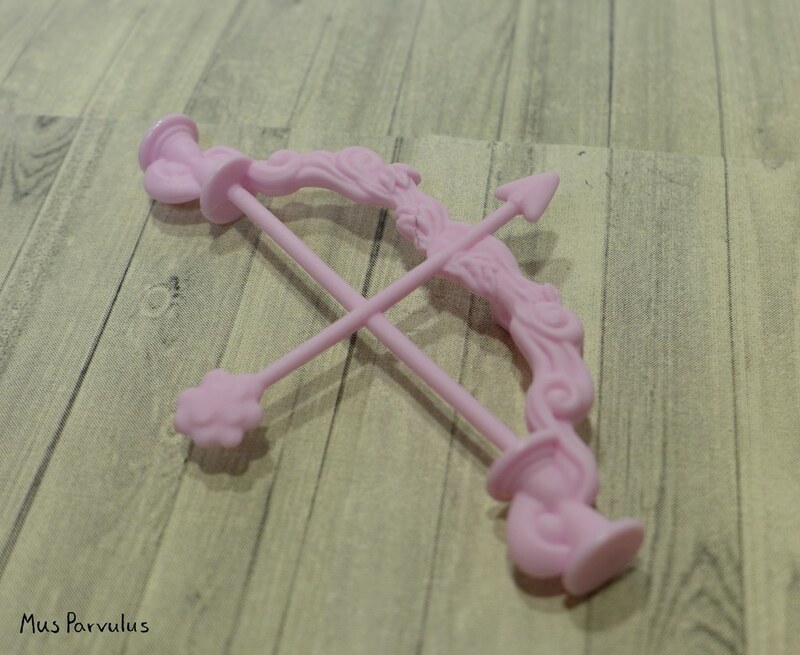 Moving onto their accessories, let’s have a look at their hairbands. They are quite similar in the general shape. The older one obviously looks more finished with four colours vs. just solid pink for the new one. 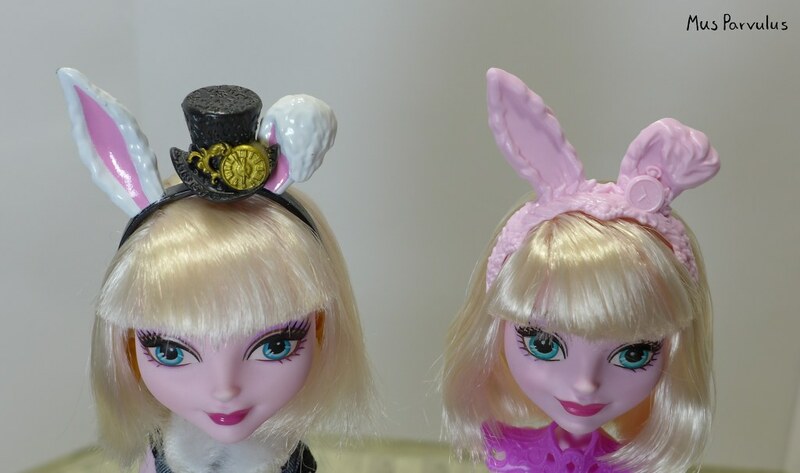 Both have a nice sculpt: the top hat suits Bunny’s style perfectly, but the simpler and more organic band on the right also has its place – it will go better with a different kind of outfit. I plan to paint in some details and use both as appropriate. The shoes are very different too, but I do not hesitate to say that the black and white boots are far better. 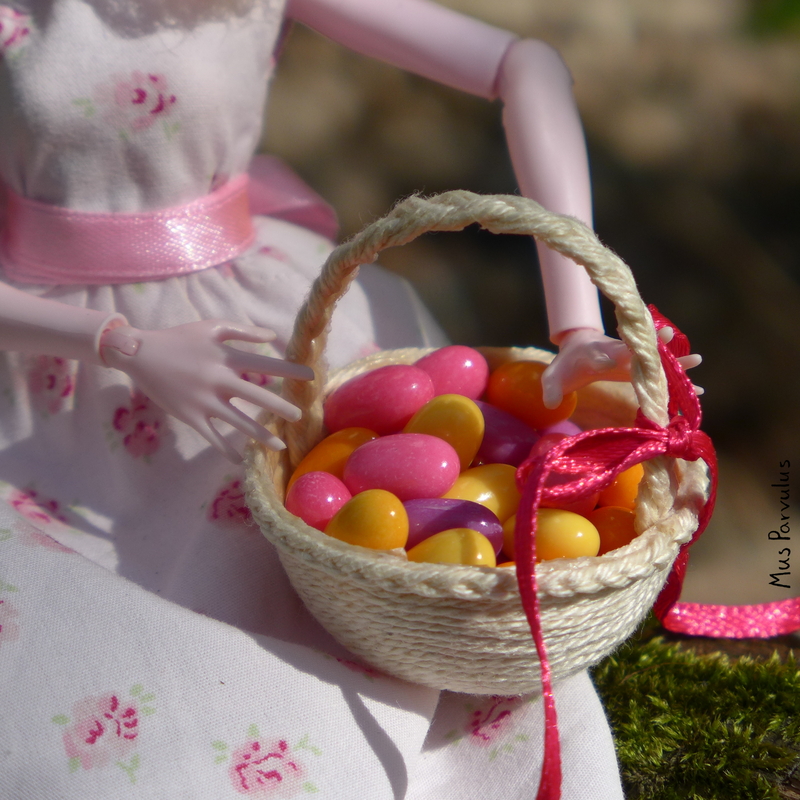 They are designed to suit the doll’s personality. They complement the outfit. They have painted details (but note that I painted in the bunny tails myself). They were actually a big part of why I wanted to own this doll. The pink shoes do little more than prevent the doll from hitting her toes on rocks and furniture, and perhaps providing hope for a better use in the future with a different outfit. 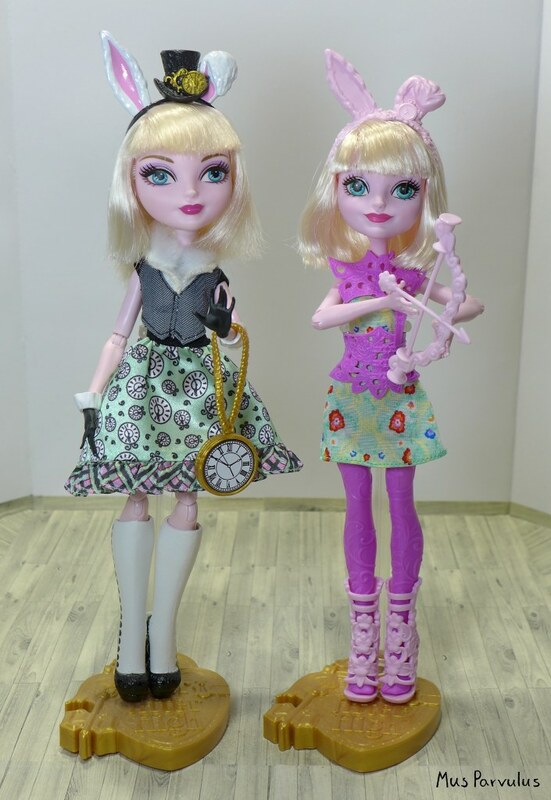 While the dolls share the same petite figure, there is a big difference in articulation (with the original having full number of typical Ever After High joints). Interestingly, both dolls have one irremovable item of clothing each. While the gloves are smaller, they still can get in the way of designing new looks. On the other hand, they are overall a positive accent in the original design, as opposed to the garish leggings that don’t even work that well with the doll’s out-of-the-box look. 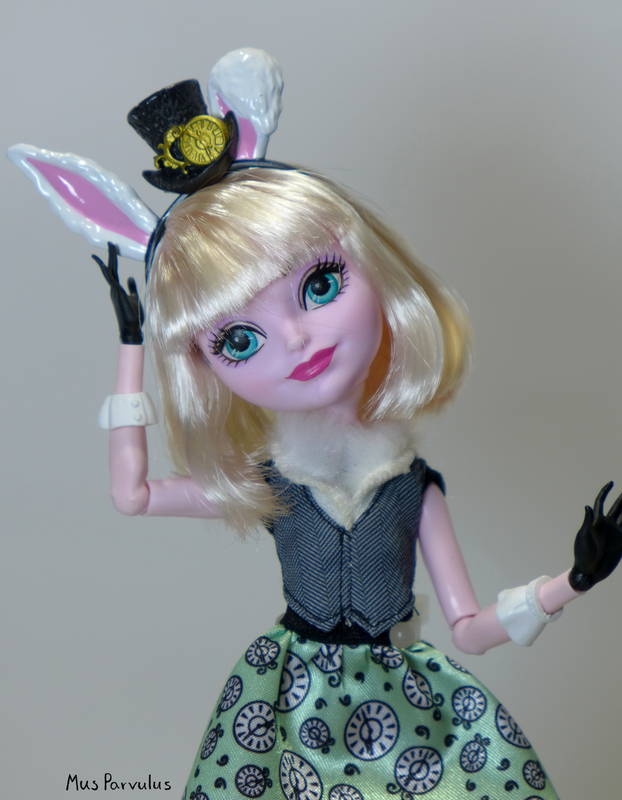 Bottom line, the hands are removable – did you know that Draculaura’s hands fit & match Bunny Blanc just right? Let’s wrap it all up. Neither Bunny is perfect, both of them have their strengths. The signature doll is definitely a richer and more sophisticated design. The Archery Club doll could perhaps be excused for being simpler, since she is supposed to be a budget doll, but I’m not even certain it’s fair, since the prices so far are very close (at least in my area). My conclusion on the price point aspect will be that I can understand a reduced number of accessories, but I do think the ones she does have deserve more attention than this. Finally, looking back to older budget lines, like the Mirror Beach, the ‘budgets’ in the past have been altogether more interesting – unless of course you’re an avid archery fan. Bunny Blanc, the Cute and Friendly Witch! I made her a hat and a few magical accessories. To be fair, opting for a hat instead of the hood left her resemblance to Wendy significantly lessened, but I guess that’s OK. I cannot entirely explain my inclination to dress the doll in jeans and a t-shirt. I know this isn’t proper witch attire, but I was visually pleased with this combination and it stuck. I guess the modern touch is in keeping with the spirit of Ever After High, where fairytale legacy meets fashion every day. Speaking of the series, perhaps we’ve finally found someone willing to poison Apple White so that her story can go on? That’s what I get for doing the work last minute on a night like this. Into the woods. The woods seem like a good place for a bunny. Easier to find than the Wonderland, anyway. Meet Bunny Blanc, a very exciting new addition to my collection. 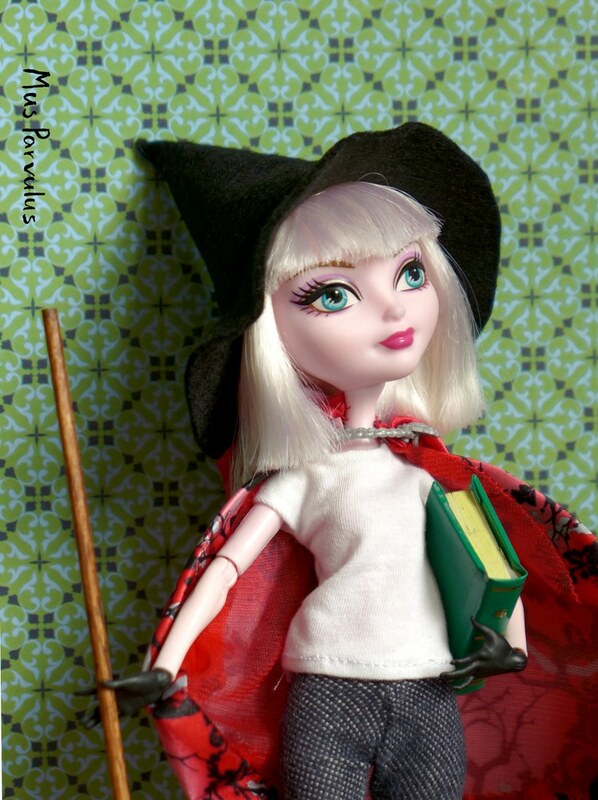 She is a Mattel doll from the Ever After High brand, and definitely something different for me. 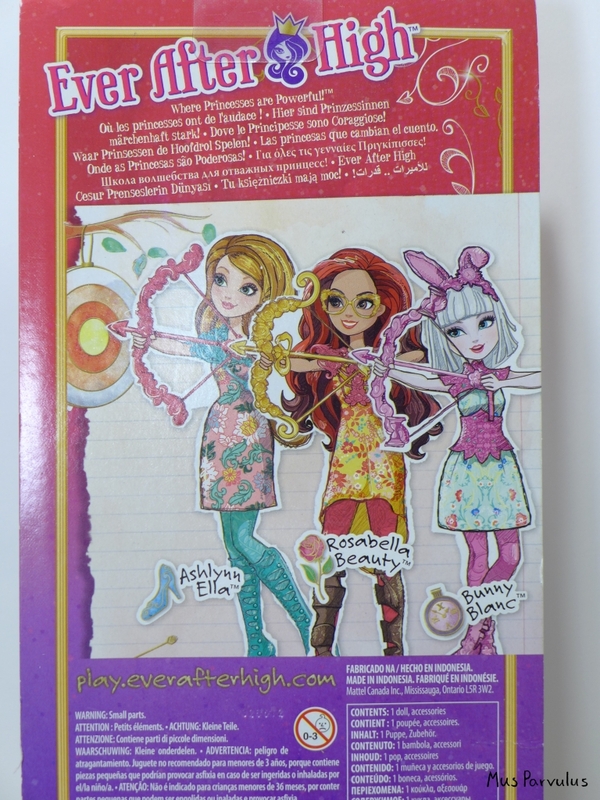 Until recently, I knew next to nothing about Ever After High. I had seen the logo somewhere, but I assumed it was a part of the Monster High brand (because they are undead… so they live for-ever after..?). Then I saw an EAH doll for the first time at Christmas, because my niece received Apple White from the series as a gift. When I asked about her, my sister-in-law explained that the character was the daughter of Snow White, at which point I assumed it had something to do with the Disney film ‘Descendants’. It doesn’t, strictly speaking. 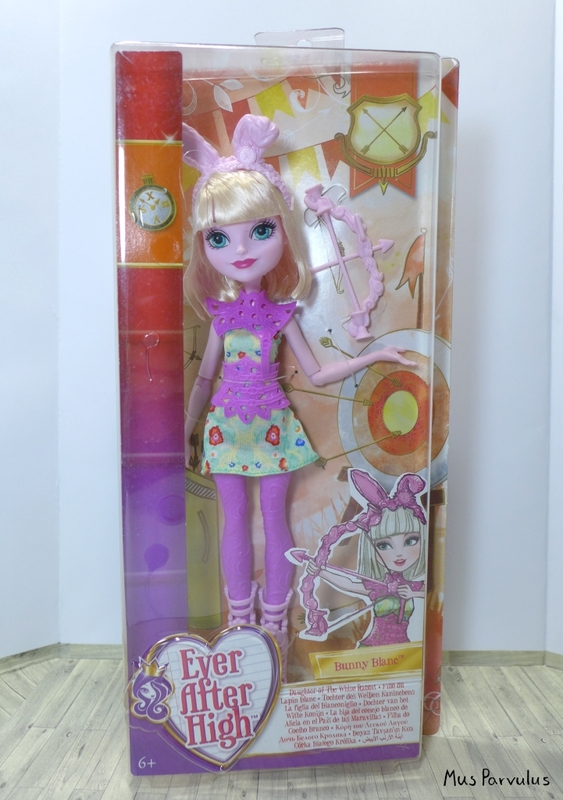 Ever After High is not licensed by Disney, but Mattel is no doubt counting on us making the association – EAH dolls are introduced by their packages as the daughter of Sleeping Beauty, the son of Alice, the daughter of Beauty and the Beast, etc. Perhaps the Disney fan in me should be offended at such cunning, but it’s not. I applaud Mattel’s intelligence in basing their characters on traditional fairytales, as everyone is free to do, but implicitly invoking a Disney feel. More importantly, I think they are simply doing a wonderful job design-wise. According to the article “The $500 Million Battle Over Disney’s Princesses: How Hasbro grabbed the lucrative Disney doll business from Mattel” the move to create Ever After High was apparently forced by the loss of Disney princess license. Unlike the author of the article, I believe that the limiting circumstances worked out for good and fostered unique creativity. Disney princesses may indeed be better from Hasbro, but their (sort of illegitimate) offspring shines coming from Mattel! I pretty much had no interest in dolls other than the Animators’ Collection until I saw an online photo of Bunny Blanc in her basic rendition. 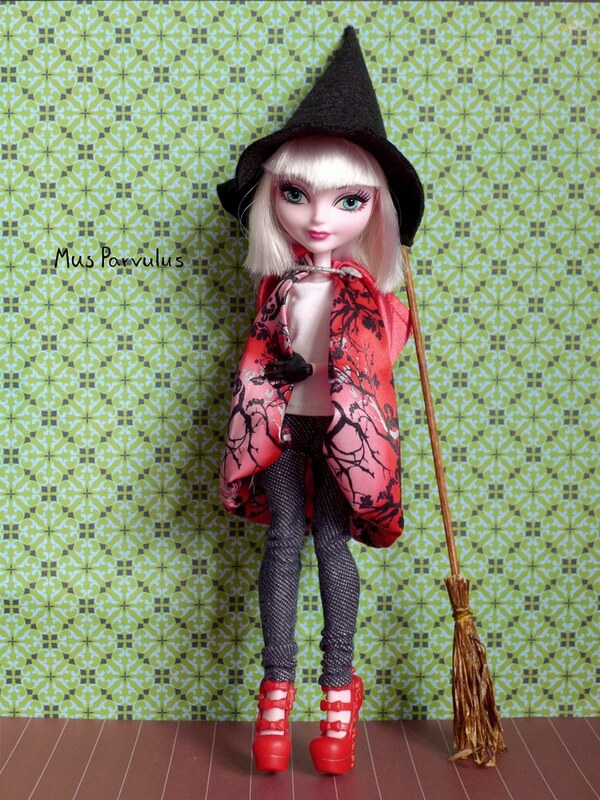 She was unlike any other doll I’d ever seen with her smart look mixed with a steampunk feel. Soon I knew I wanted her. Sometime at the begging of May I saw her in a local toy shop and took her home with me. You may have to take my word for it, but the box states that she is the daughter of the White Rabbit – presumably the one from Alice in Wonderland. I do not want to know how that happened, but I do like the result. Writings on the box are not the only thing which makes the product available in these parts of Europe (Poland in my case) different from what I initially saw online. On the negative side, the doll is missing the collar and pink scarf piece seen in the drawing, which does appear in the original release. That is sad news, but I decided to buy the doll anyway. On the more positive side – while many people find the doll’s eyes wonky – and I can see why – but I wonder if perhaps my version is somewhat less crazy-eyed, if not perfect. What do you think? You may have noticed that her hair looks different in the above photo and in the box. Straight out of the box it was stiff and sticky, but thankfully it’s very easy to get in order. Just wash and let dry, no styling required. I will comment on the details, though. Notice how intricate they are. The white part is textured like leather, and the black part has numbers printed on it. The heel is sculpted like an hourglass. Both shoes are topped with bunny tails. My localised version doesn’t have them painted white as it should, but it’s OK, I’ll take care of that. There is a clock on Bunny’s top hat too. The hat is attached to a headband with bunny ears. 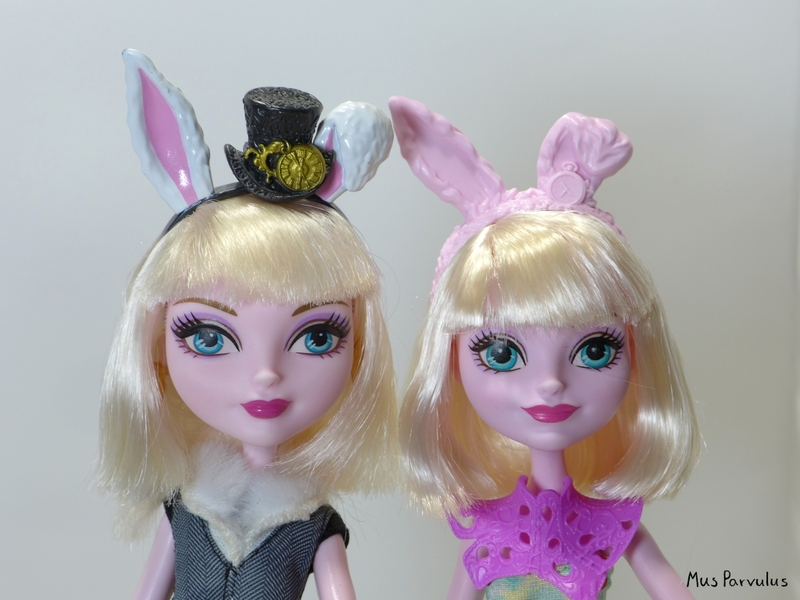 I’m not sure if the ears are a fashion accessory or if they are supposed to be genuine, living bunny ears in the doll world. The hat has the same design as the shoes. I half-expected that the clock being gold all over is another omission, but it’s not. In fact, it’s the same even in the Ever After High cartoon. Nonetheless, I am tempted to repaint it to give it more detail. I like the colours. They complement the blacks and whites, but without disrupting the smart look. The skirt is asymmetrical- longer on the left, shorter on the right. It all consists of one piece – the skirt, the top and the vest are all connected. I love her gloves and cuffs – so smart, so cute! The fingers look very graceful. One of the cuffs has a watch attached. It’s another element which I’m tempted to paint, but I am concerned it might overcrowd the outfit with too much detail. The doll can’t stand on her own – unless you balance her very, very carefully and stop breathing in her proximity, but she comes with a nice-looking stand. 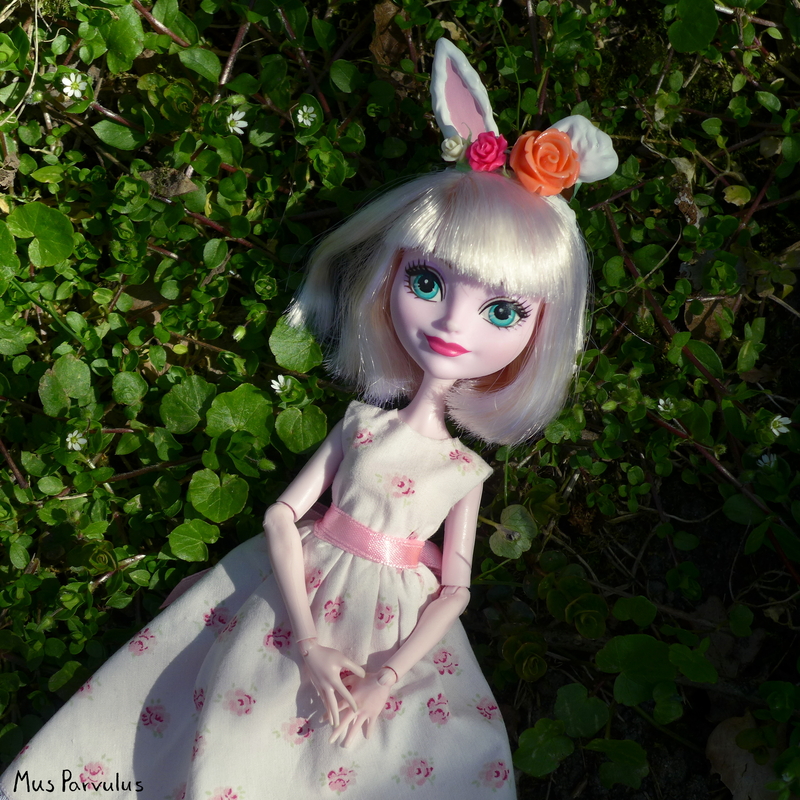 I was about to finish the photo session with some more creative photos featuring Bunny, but, alas, my camera broke in the process! This is by no means the doll’s fault, though 🙂 My camera, the Fuji XF1, has unfortunately been known to be susceptible to a lens control error. It’s the second time it has happened to this camera, unfortunately this time it’s no longer on warranty 😦 But fear not, I can’t live without a camera, so I’ve already found a replacement. This means there will definitely be more photos, of Bunny Blanc and otherwise.